Udupi, June 22, 2015: Speaking at the International Yoga Day celebrations at Ajjarkadu district stadium on June 21 Sunday morning, Urban Development Minister Vinay Kumar Sorake said that Yoga was India’s special contribution to entire world to overcome all ills and to develop a healthy body and mind. ’Yoga’ means unity togetherness. The minister said the International Yoga Day celebration had given global recognition to India, which has practised Yoga for ages. Yoga has no political or party identities. Practising Yoga should neither be associated with Congress nor BJP, he added. Udupi-Chikkamagaluru MP Shobha Karandlaje was present on the ocassion. Saligramma : In a separate programme organised at Divine Park at Saligrama, wellknown psychiatrist Dr P V Bhandary gave a number of examples on how Yoga had helped in medical field. MLC Kota Srinivas Poojary was present. Dharmasthala : About 800 students including NCC cadets, students of several schools and college did Yoga. MP Oscar Fernandes, Minister K Abhayachandra Jain and many were present. Konkan railways ; International Yoga Day was observed by Konkan Railway at prominent locations like Karwar, Bhatkal, Udupi and Regional Railway Manager’s camp office at Mangaluru. Ramakrishna Mutt : Ramakrishna Mutt and Ramakrishna Mission in association with NSS unit of Mangalore University and Nehru Yuva Kendra observed Yoga Day in a long special programme. 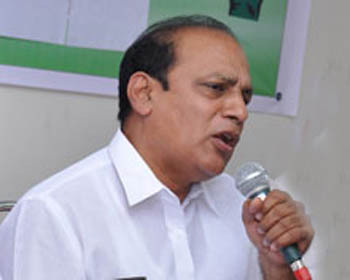 Mangalore University : The Yoga Day held at Mangalore University marked many programmes, VC Prof K Byrappa said Yoga was an asset to the country. It is a part of our ancient Indian culture. And there was a need to take up research in Yoga. The research scholars of department of Human consciousness and Yogic Science presented a demonstration on various asanas. Many students and citizens participalted with dedication and interest.